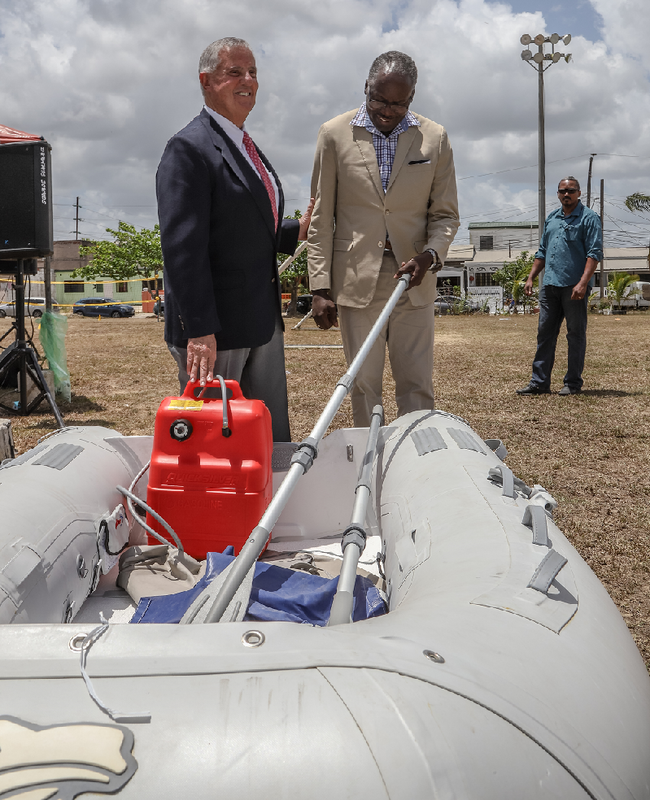 SAIL AWAY: US Ambassdor to TT Joseph Mondello and La Horquetta/Talparo MP Maxie Cuffie inspect one of the four inflatable boats donated to the Tunapuna/Piarco Regional Corporation yesterday. US Ambassador to TT, Joseph Mondello, yesterday extended support to National Security Minister Stuart Young and the Government in relation to the proposed migrant framework policy which seeks to regulate and assist Venezuelans living in TT. Speaking with reporters after the opening of a family fun day, organised by the US Embassy and the Tunapuna/ Piarco Regional Corporation at Phase Five La Horquetta, Mondello said he would not second guess the decisions of the Government and gave his support to the policy. The policy seeks to register Venezuelan immigrants, both legal and illegal, in TT allowing them to work for one year and receive basic health care. Registration is open from May 31 to June 14. The fun day also served as a handing over ceremony for four inflatable boats donated to the corporation from the embassy, to assist in flood preparedness and response in the community. During the opening ceremony, councillors recalled the fear and uncertainty they faced during heavy flooding last year and thanked the embassy for their support in donating the boats. Chairman of the corporation, Paul Leacock, said he was grateful for the donation and recalled the courage of residents in helping their neighbours during the flooding. He said he intends to nominate four young men from the community to receive President’s medals for gallantry for rescuing others from the floods. Reply to "Mondello backs migrant framework policy"